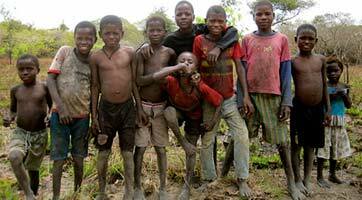 The situation of Angolan children is especially serious and troubling. This country, ravaged by poverty and related problems (malnutrition, lack of water, health…) must quickly find ways to alleviate these serious violations of the rights of children. 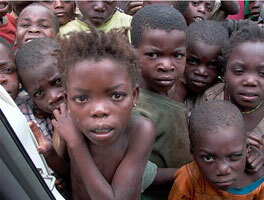 40% of the Angolan population lives below the poverty line. This problem create large disparities between Angolans. Most of the population must fight to survive while a small few hoard most of the country’s wealth. This very disparate economy is mainly the result of the oil trade. In fact, this country is the number one African exporter. Children, much more receptive to the consequences of poverty, suffer from it every day. The infant mortality rate in Angola is one of the highest in the world and the average life expectancy of an Angolan is extremely low. Structures, material, as well as qualified personnel are largely insufficient. Hygiene, healing, and care are not offered to everyone. The AIDS virus is also widespread in Angola. There are estimated to be 190,000 people who are HIV positive, the majority of them women. This illness cruelly affects the life of children: many of them are orphaned by AIDS. Others are HIV positive from their birth because the virus is transmitted to them by their mother. 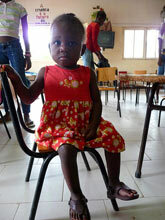 Another very troubling problem for the health of Angolan children is the return of polio. In fact, since 2005, the country has again tried to eradicate this particularly murderous and painful disease. Despite ever increasing vaccination campaigns in the country, some children regularly die or are handicapped by the disease. Malnutrition, a direct consequence of poverty, is a serious and troubling problem in Angola. Families can’t give their body as much food as it needs. Children, with weaker bodies and health, are more vulnerable and suffer seriously from hunger. Malnutrition is one of the main causes of child death in this country. The drinkable water available to the Angolan population is gravely insufficient. This vital resource is expensive, and many families make use of river water. Because of this, hygiene is seriously lacking and the health of children is mainly affected by it. The fight against epidemics and viral diseases is proving much more difficult. Diarrhoea is the main result of unclean water and leads to the death of many children each year. 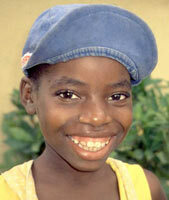 More than 40% of Angolan children are not educated. School is, in principle, free and mandatory. However, education in general leads to numerous additional expense, leading to the rates of absenteeism and drop outs. Schools are few and sometimes completely absent in the most remote regions. Additionally, classrooms are deplorable: lack of sanitation, ruined buildings, limited teaching, and untrained teachers are the main problems. Child abuse is widespread in Angola, even more so because it is largely tolerated. Some belief systems even advocate child abuse. Specifically, this is the case regarding “witch children”; these children, who are generally the poorest, are accused of witchcraft. Because of this everything is permitted and even recommended when they are encountered. They are cruelly beaten and tortured, and their family is isolated and deprived of food and water. The influence of some ancient traditions even incites some Angolans to kill children they believe to be witches. Other forms of child abuse happen in prison settings. Already overcrowded, a large majority of prisons aren’t able to create space reserved for minors. Because of this, they are mixed with the adults. Unfortunately, the prisoners as well as the guards benefit from their youth and children are regularly victims of abuse. In Angola, close to 1 in 4 children is forced to work to support the needs of their family. However, legislation in the country forbids child labour for those younger than 14 and subject to parental authorisation, younger than 16. However, the effectiveness and control of these standards are too weak to be fully respected. Numerous children are employed on plantations or as fishermen. They only receive a pittance, enough to prepare a meal. Other children are exploited by illicit commerce: drug trafficking, human trafficking, forced prostitution…They risk their life every day and grow up in deplorable conditions. 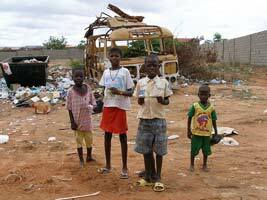 In Angola, a troubling number of children live in the streets. Their situation is sometimes caused by their family being separated by conflicts or even because they have fled their home to escape abuse. Once in the streets, these children, sometimes very young, find themselves alone with no resources. They are then forced to take drastic measures in order to survive. Begging, illegal commerce, or prostitution, they are easy targets for major traffickers and exploiters of children, who don’t give them a choice. Close to 70% of births are not officially recorded by Angolan public authorities. Because of this, these children don’t have an official identity or a nationality. The costs incurred by birth certificates are much too high for these poor families. This results in great difficulties for these people, because they will not be able to exercise their rights as they are considered invisible in the eyes of society. What’s more, children without an identity often find it impossible to access education.